There are many ways to pass information (e.g. values, user selection) from one scene to another in a running experience. In this article we are going to review 3 different ways which should fit all your needs. All screen shots in this article come from the sample experience here. Feel free to try things out yourself. Binding enables you as an experience designer to share trigger, action and property values with other triggers, actions and properties. To create a binding, click the orange icon that appears to the right of any property, trigger parameter or action parameter over which you hover your mouse. Doing so implies you want this particular value to come from some external source. The binding panel opens, enabling you to select the source item and value. This source could be in any scene of the experience. 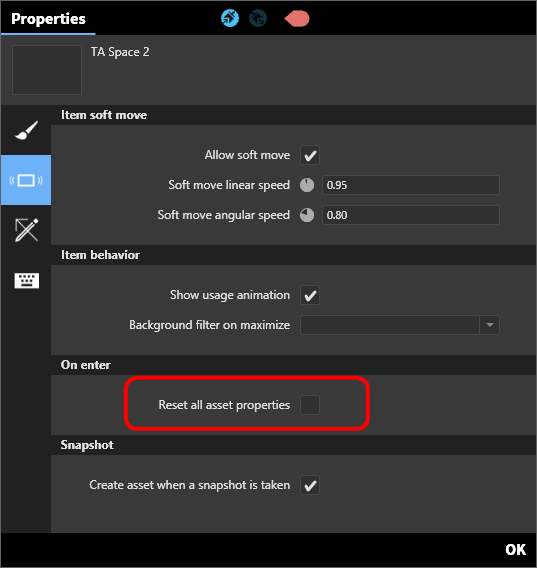 the destination scene's property Reset all asset properties must be turned off. If turned on, the value passed to the action would be overridden by a default value when entering the scene. WHEN OK button is pressed and released THEN in Scene 2, call the Set Text action for the Text asset with the Set Text parameter bound to the Text Input asset in Scene 1. See image below; click to enlarge. All Interface Assets (IA) can be reached from anywhere within an experience. As a result, IA properties act as global variables. A special case is the Global Variable interface asset that exists explicitly for the purpose of holding a value across scenes. Of course, your IA could be much more functional, implementing business logic that can process information. 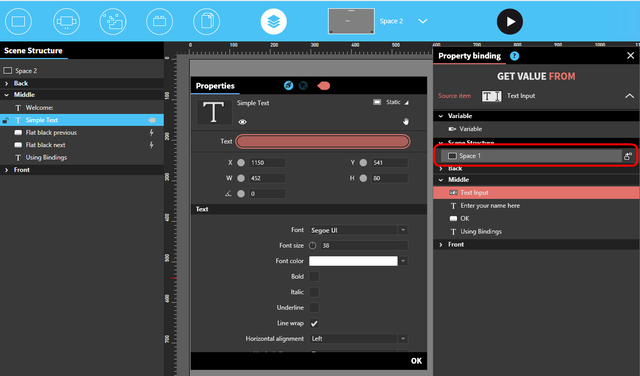 In the image below, the value of a Text asset comes - via binding - from a Global Variable interface asset. Click the image enlarge.